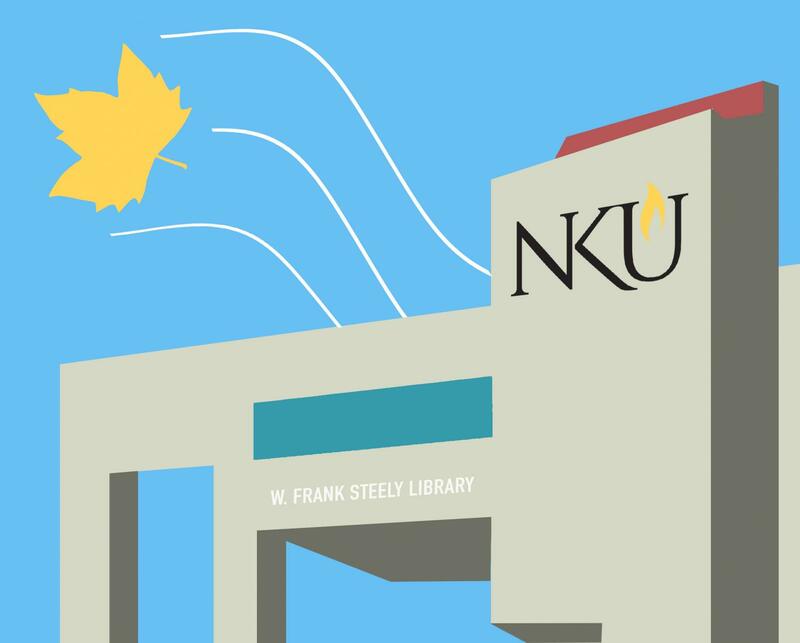 Why is NKU so windy? A bespectacled Dr. John Metz stands next to a window in the offices on the fourth floor of Landrum Hall, gesturing to the cityscape – not a cloud in the sky to obscure the view of downtown Cincinnati. From all the way up here, it’s pretty clear why it’s called Highland Heights. According to Kentucky Place Names by Robert M. Rennick, the area was called “The Highlands” for most of the 19th Century because of its relatively lofty elevation. Compared to neighboring Boone, Campbell County has higher wind rates. Metz drew a rough diagram of the United States as he explained that low pressure systems drive our weather patterns. These systems are spinning masses of air in the sky that pull in air of different temperatures while reducing the pressure below them. “The bigger the difference in pressure, the stronger the winds,” said Metz, while doodling the rest of his explanation on his sketch of the U.S. According to Metz, scientists use a unit called millibars to measure atmospheric pressure. On an average day on campus, it’s about 1000 millibars. Due to NKU’s higher elevation, the atmospheric pressure is less, and when low pressure systems reduce that further, the winds get stronger. Can we use wind power here? Simple science explains why it’s windy, but can this wind be used for something more than making it impossible to use an umbrella when it rains? According to Tess Phinney, NKU’s sustainability manager, wind turbines have been a topic of conversation before. The U.S. Department of Interior believes wind power to be very cost heavy upfront, meaning it would be a big investment for campus. 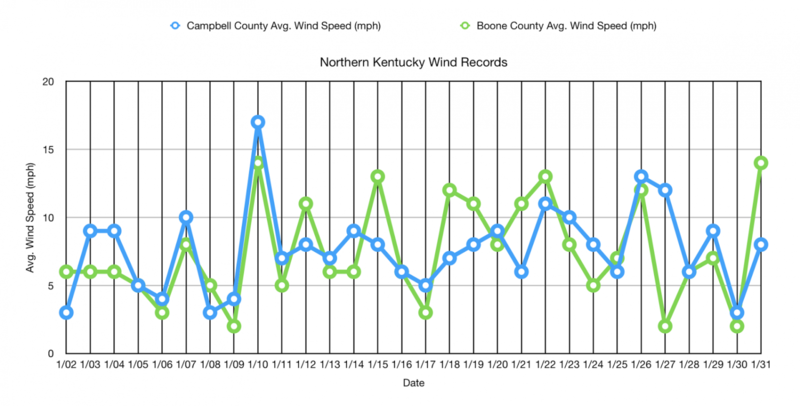 Windy days might stand out more to folks because of the hassle they cause, but data collected by Western Kentucky University’s Mesonet supports this statement. 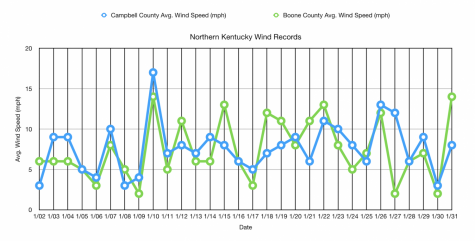 In the last month Campbell County has seen only four days with the average winds exceeding 10 miles per hour. Quality wind resources are classified by the Department of Interior as being an average of 13 mph annually. Dr. Kirsten Schwarz, an urban ecologist and associate professor of biology at NKU, has spent many years studying urban environments and the systems within them. While some believe the design of the campus might cause such uproarious winds, Schwarz doesn’t think that’s the case. “The presence of pavement, that can have an impact on water movement on campus,” Schwarz said. If NKU has anything in abundance it’s pavement and impervious surfaces, and the narrow channels between buildings might make the breeze pick up. According to Schwarz, the hard-edged architecture of campus lends itself mostly to water runoff. NKU’s design may still have an important effect on students, regardless of how fast the wind blows. How students interpret the campus is another question entirely. Changes stemming from NKU’s master plan and a push to expand could alter student focus as well. Phinney, however, is not ruling wind turbines out yet.